In today’s economical-minded world, Americans thrive on fuel-sipping compact cars when gas prices climb. With the downturn of the economy being a stark reminder for many, the economic sense gets the best of us at times, specifically, when shopping for that next vehicle. 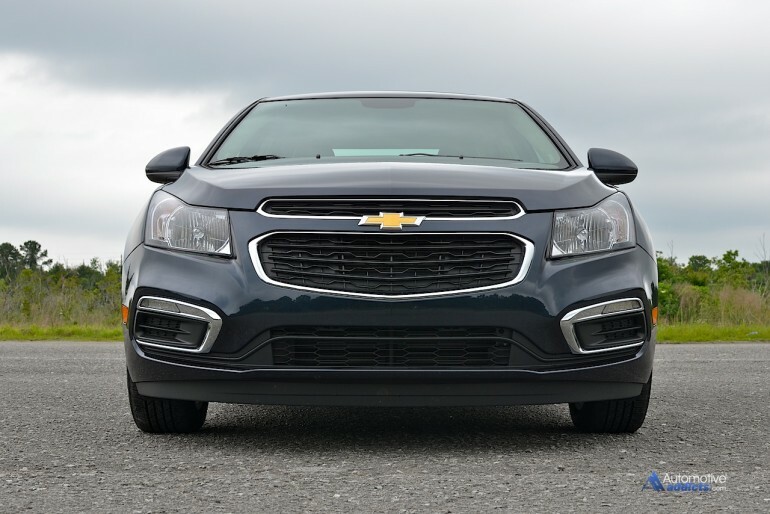 Chevrolet is paving a way to captivate a unique genre of buyers by giving them a plethora of options in the compact car segment with the new 2015 Chevrolet Cruze. 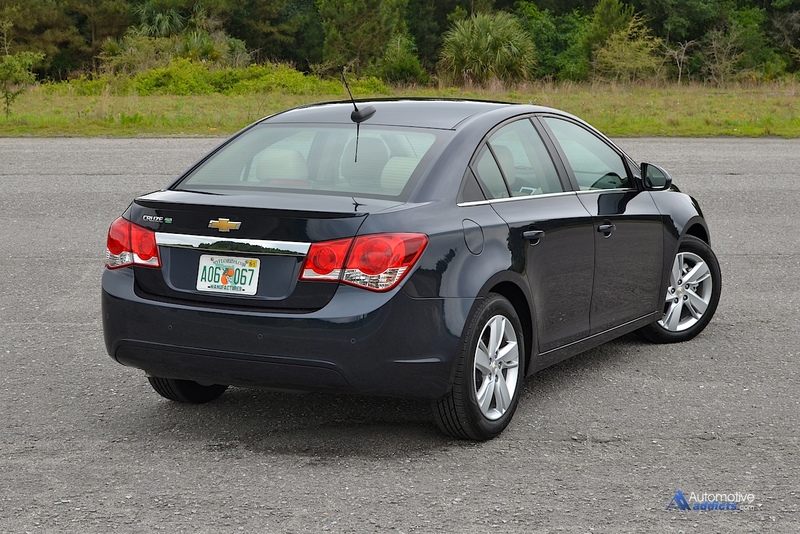 Get clearance pricing on the Chevrolet Cruze from a network of dealers to get you the cheapest price. Use a simple form to select the make and model and start saving. Remember to get quotes from the maximum number of dealers to give you the upper hand. 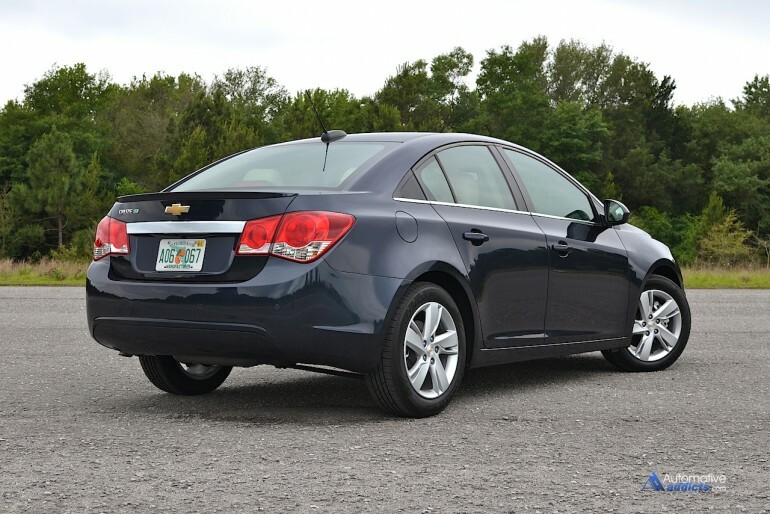 Get a Free Quote on the Chevrolet Cruze or other vehicles now. 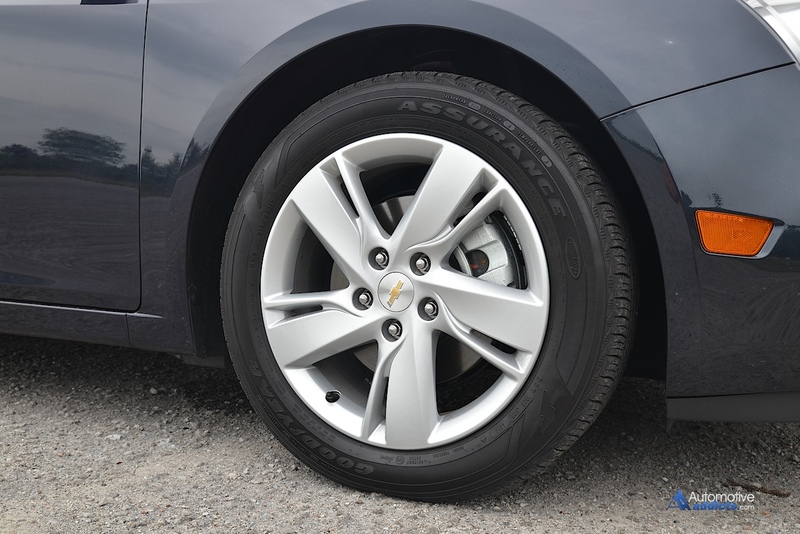 Chevrolet offered the Cruze in a diesel flavor as a new entry for the 2014 model year, featuring an astonishing EPA consumption figure of 46 mpg on the highway, 27 mpg city and 33 mpg combined. 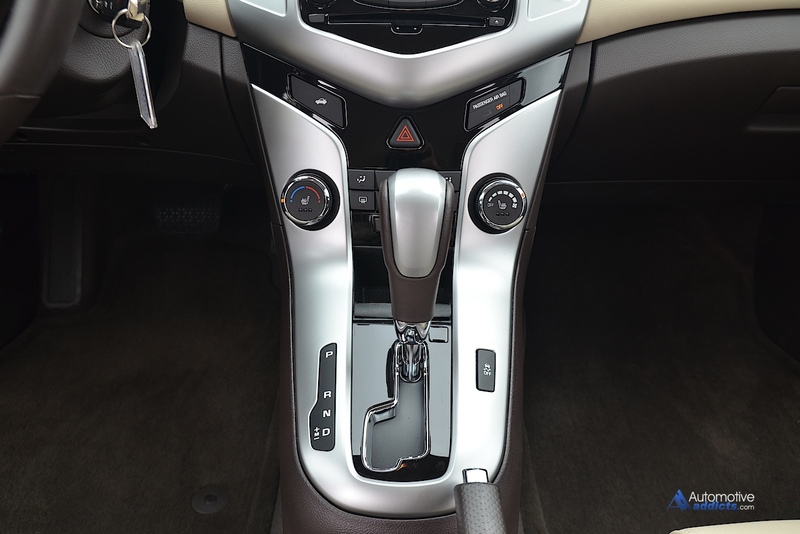 For 2015, this formula continues to give buyers an alternative to the norm where the Cruze’s 2.0-liter inline 4-cylinder turbo diesel engine is a choice for penny pinchers who feel that they are not compromising performance for efficiency – basically, they want their cake and to eat it too. 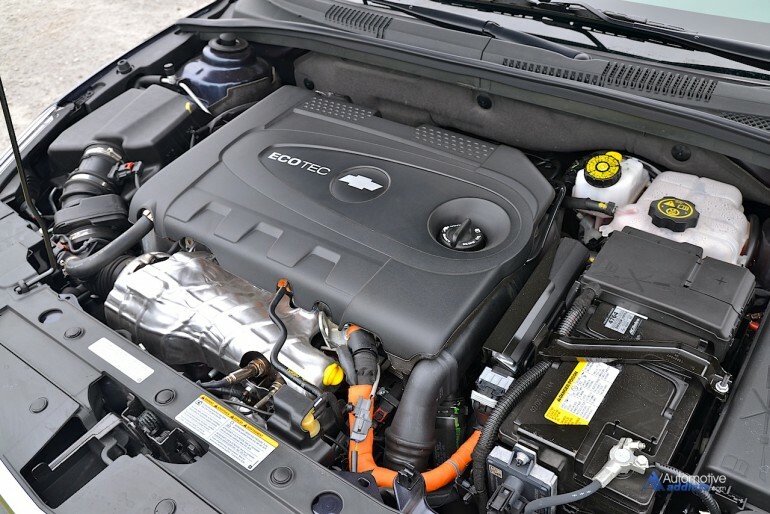 The powertrain choices for the compact Chevrolet Cruze serve up several offerings for gas-powered variations while the diesel option pits the highest power output in its 151 horsepower and 264 lb-ft of torque numbers. 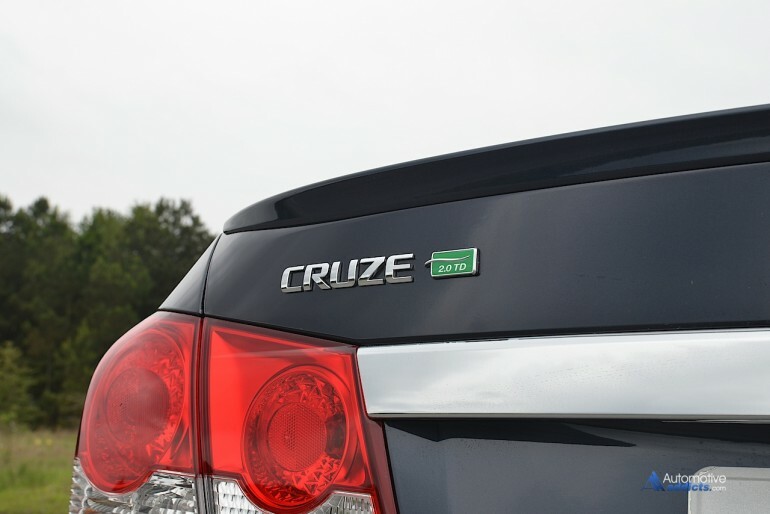 Moreover, the diesel Cruze offers the best fuel economy of its multifaceted trim level array. 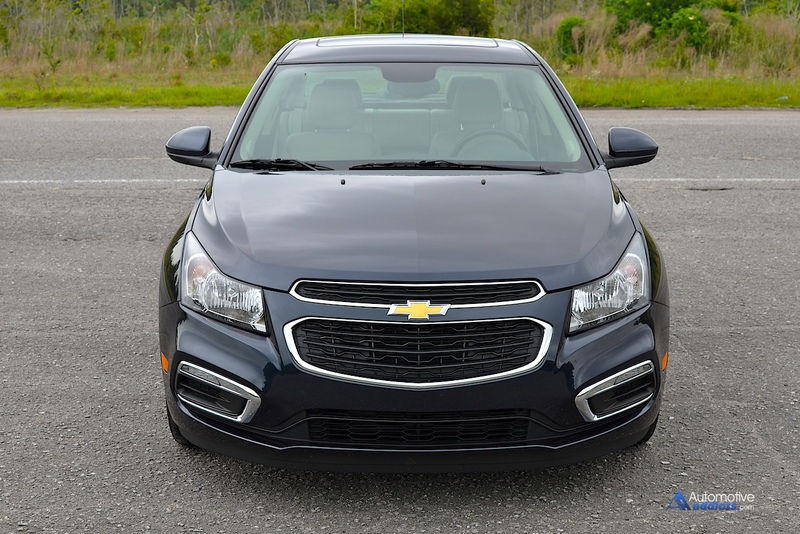 In selecting the new 2015 Chevrolet Cruze 2.0 Turbo Diesel you opt for the top-tiered trim level borrowing the feature content from the gasoline-powered LTZ variation. Unfortunately, this is the only way to have the Cruze Turbo Diesel, which naturally brings a higher price point, one that trumps all other Cruze trim levels (L, LS, LT, Eco, LTZ). With an already desirable chassis, attractive sheet metal, and decently-sized interior proportions, the Cruze aims to take on its Jetta TDI competition head-on. While I deeply believe Chevrolet is testing the diesel waters in the compact sedan segment, the Cruze proves to be a decent platform to make the argument for those penny pinchers who want the best aspects of an ultra-efficient compact sedan wrapped up in a complete package. 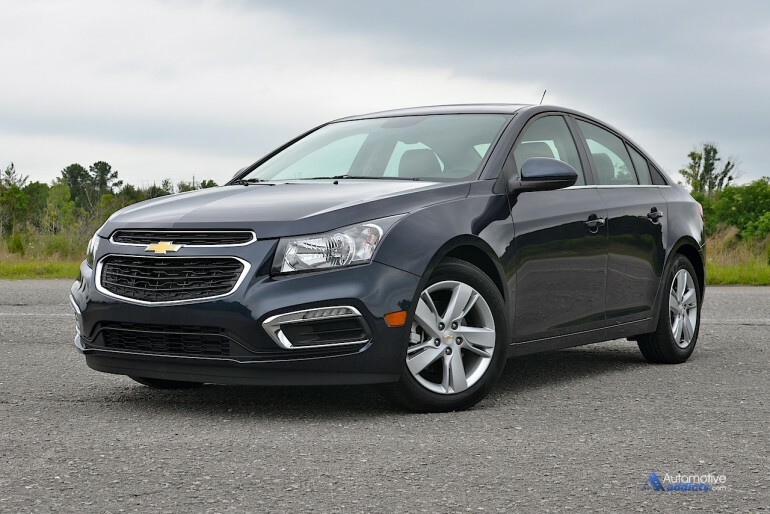 As a complete package, the 2015 Cruze Turbo Diesel is just that. The feature content on my test vehicle is just enough to keep a wide range of consumers interested. The power from the diesel-fuel-miser 2.0-liter 4-cylinder aims to please with the Cruze getting up to 60 mph in 8.6 seconds, which is on par with its VW Jetta TDI competition. Power delivery is a bit delayed where the turbo diesel suffers from some turbo lag out of the hole. Once things spool up, the surge of torque nearly breaks the front wheels loose in a split-second succession followed by the 6-speed automatic transmission’s smooth shifts. The 6-speed auto box is well tuned to meet the turbo diesel engine’s sweet torque rpm range, which is somewhat short as expected for such a powermill. It does, however, take some getting used to when driving the new Chevrolet Cruze Turbo Diesel, as full throttle inputs aren’t always going to get all that you asked for. 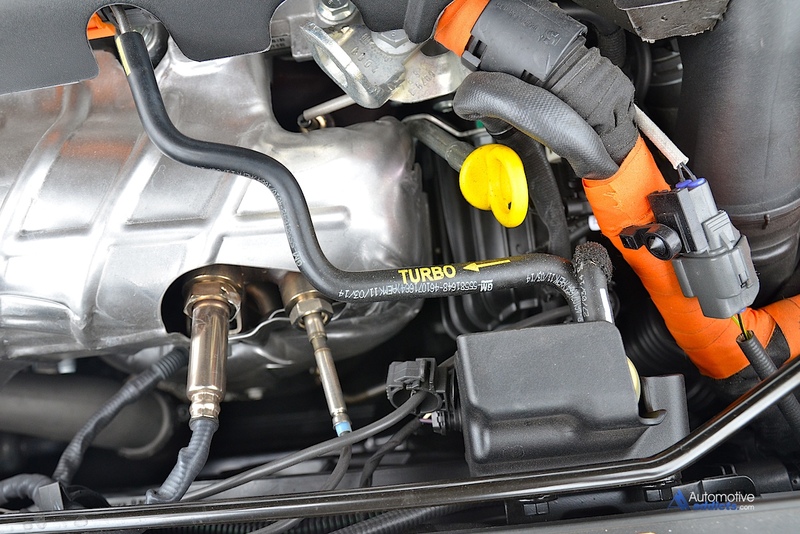 At times, mid-throttle inputs are all that is required to sometimes utilize an overboost feature to infrequently transmit as much as 280 lb-ft of torque from the engine for up to 10 seconds. Once things are in motion, the Cruze Turbo Diesel behaves nicely on the road with much of the handling and decent mix of sport and comfort balanced much like the LTZ trimmed gas-powered Cruze. The downside of the new Chevrolet Cruze Turbo Diesel starts with the clattering noise from the diesel engine and ends with its pricing nearly hitting the $30,000 mark for my loaded-up test vehicle. Those old connotations of diesel engine’s being brash and noisy are alive and well in the Cruze Turbo Diesel, unfortunately. However, viewable exhaust fumes is absent from the equation, so there’s that. In tolerating repetitive clatter from the diesel engine, Chevrolet seems to put forth an effort to isolate the noise from the cabin. Bystanders and onlookers will get an earful of that clatter only to express a serious discernment on their face – some thinking out loud by asking if there is something wrong with your car – and yes, this happened when picking up my daughter from school. The harshness from the diesel as it spins faster tends to find its way into the cabin, hardly the welcomed character you expect on your way to scoring nearly 46 mpg on the highway. 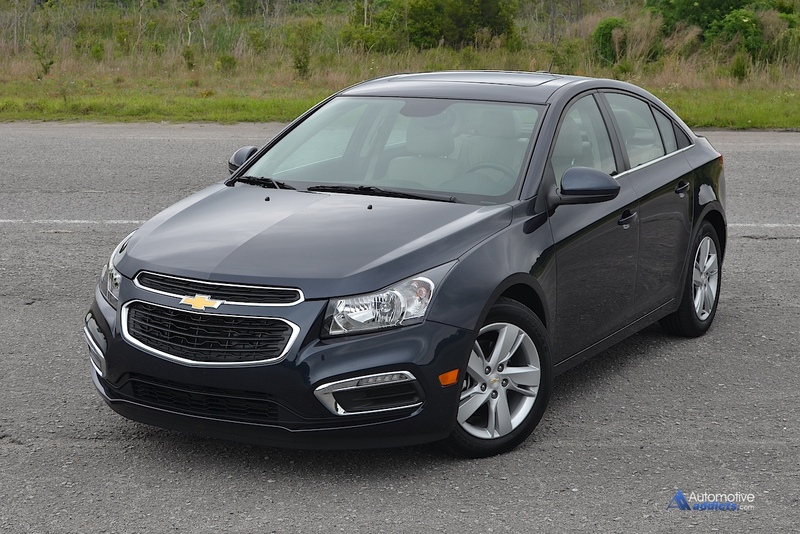 Visually, the 2015 Chevrolet Cruze Turbo Diesel remains mostly unchanged from its gas-powered trim counterparts. The subtle differences remain to be the exclusive 17-inch forged aluminum wheel design, a smallish and green “2.0 TD” badge on the trunk lid, and for obvious reasons, the gauge cluster is slightly modified to match the diesels low-rpm-revving range along with asking for ultra-low sulfur diesel fuel above the slow-to-empty fuel gauge. Interior appointments remain to fit well with the compact sedan segment without many surprises. The limited amount of soft touch surfaces tend to get overtaken with my test vehicle’s overshadowed hard plastic brown trim and dashboard surface. 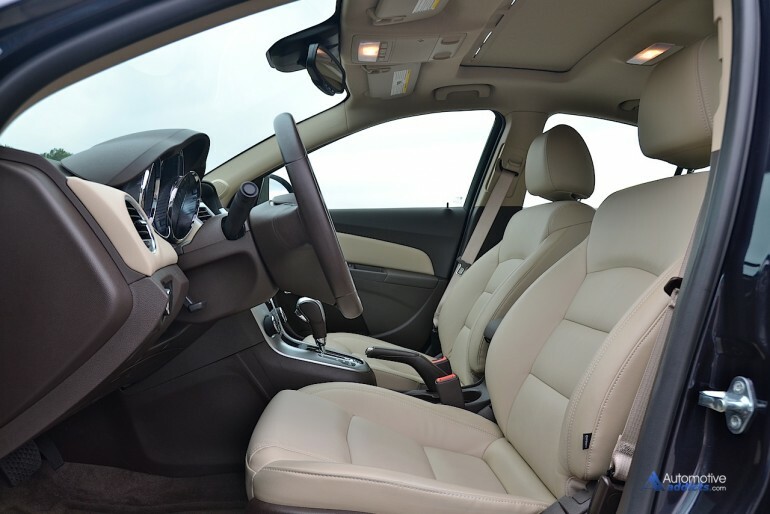 The Cruze’s interior is not overly cheap-looking, it just has a hard time fooling anyone with any luxury appeal other than from the high-resolution 7-inch infotainment touch screen. 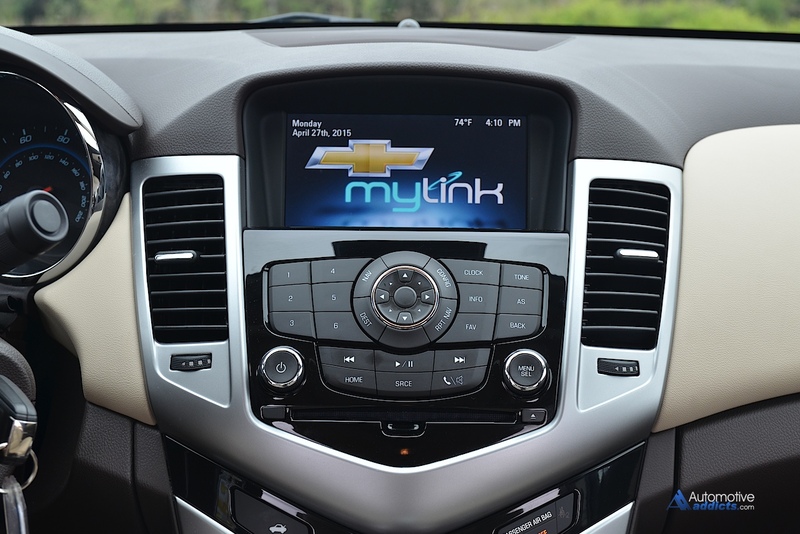 The MyLink system proved to be the best iteration thus far for Chevrolet combining several vehicle settings, audio controls, navigation and a suite of apps (Pandora, Stitcher radio, Weather, Movie show times and Fuel prices). The control redundancy is made possible through use of the touch screen and a plentiful array of dashboard buttons. Another positive aspect with the Cruze’s tech is the addition of a 4G LTE WiFi hotspot and Bluetooth connectivity with audio streaming. Seating comfort is as expect from a modern compact sedan. Up front the seating area is ample giving you a cockpit feeling with the wrap-around of the limited soft-touch trim. 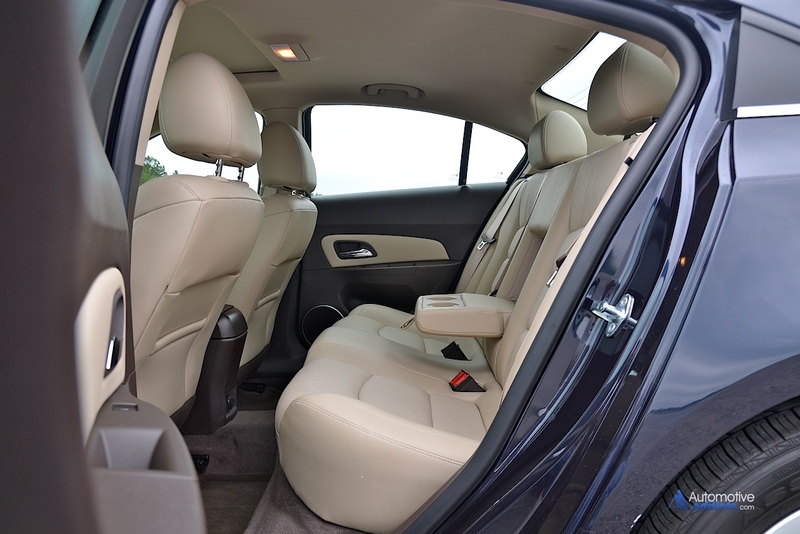 Rear seating is comfy for two adults, but three is really pushing the boundaries of the Cruze’s small size. The rear seat armrest seems to be an afterthought as it is exceptionally short and serves hardly any good use to adults other than solely acting as a dual cup holder. In all, the Chevrolet Cruze Turbo Diesel is a desirable purchase for those willing to give a little noise pollution in return for exceptional fuel economy, but it all comes at an inevitable price. I saw consumption numbers matching the EPA estimates on the highway and nearly 30 mpg in the city. While the new Cruze Turbo Diesel has its work cut out to capture potential Jetta TDI buyers, the benefit comes from Chevrolet’s already-proven Cruze platform. Things tend to get interesting when you consider the as-tested price of my 2015 Chevrolet Cruze Turbo Diesel nearly breaking the $30-grand mark at $29,105 including an $825 destination charge. Base price stands at just $25,660 for the 2015 Chevy Cruze Turbo Diesel. 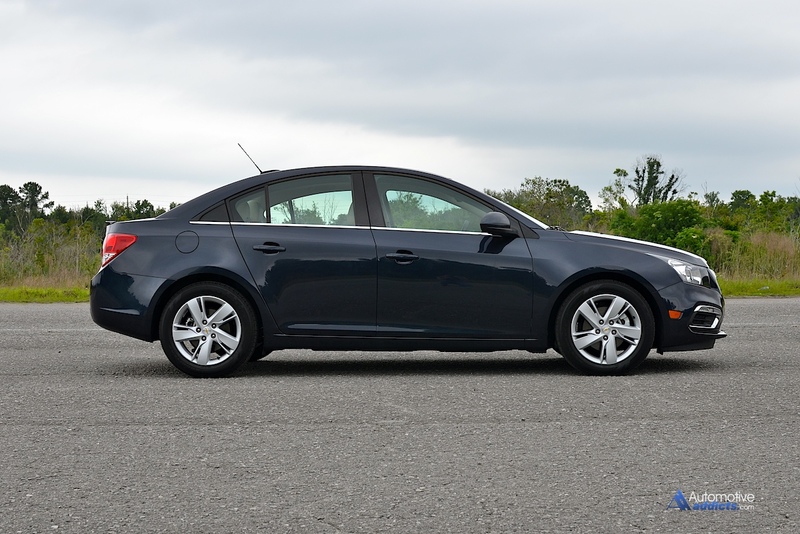 Even though the optional feature content is relatively rich (sunroof, premium audio, rear parking assist, blind zone alert, rear cross traffic alert, navigation system, rear vision camera, auto dimming mirror and power adjustable outside mirrors), comparable offerings getting similar EPA results could sap the Cruze Turbo Diesel’s lime light. Still, it would be judicious to give the 2015 Chevy Cruze Turbo Diesel a gander before settling on something from the other side of the pond.